Massachusettense Institutum Technologiae, sive breviter MIT, est universitas praeclara studiis scientiarum naturalium atque institutione rerum technicarum, Cantabrigiae in urbe rei publicae Massachusettensium anno 1865 fundata. "Mens et manus" sententia instituti est. ↑ Brown awards six honorary doctorates (Susan Solomon). Despectus ex aere in universitatem. In media imagine Tholus Grandis. Aedificium principale universitatis Tholo Grandi praeditum. Jarzombek, Mark. 2003. Designing MIT: Bosworth's New Tech. Northeastern University Press. ISBN 1-55553-619-0. Leslie, Stuart W. 1994. The Cold War and American Science: The Military-Industrial-Academic Complex at MIT and Stanford. Columbia University Press. ISBN 0-231-07959-1. Mitchell, William J. 2007. Imagining MIT: Designing a Campus for the Twenty-First Century. The MIT Press. ISBN 978-0-262-13479-8. Prescott, Samuel C. 1954. When M.I.T. Was "Boston Tech," 1861–1916. Technology Press. ISBN 978-0-262-66139-3. Peterson, T. F. 2003. Nightwork: A History of Hacks and Pranks at MIT. The MIT Press. ISBN 978-0-262-66137-9. Simha, O. Robert. 2003. MIT Campus Planning: An Annotated Chronology. The MIT Press. ISBN 978-0-262-69294-6. Snyder, Benson R. 1973. The Hidden Curriculum. The MIT Press. ISBN 978-0-262-69043-0. Stratton, Julius Adams, et Loretta H. Mannix. 2005. 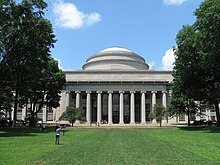 Mind and Hand: The Birth of MIT. The MIT Press. ISBN 978-0-262-19524-9. Vicimedia Communia plura habent quae ad Massachusettense Institutum Technologiae spectant. Bibliographia apud Institute Archives & Special Collections. Novissima mutatio die 26 Novembris 2018 hora 15:40 facta.